New Santa Ana | Santa Ana solar panel program coming to a close! SANTA ANA, CA (March 27, 2012) – Santa Ana’s Solar Program is an innovative program that allows residents to go solar for no upfront cost and receive substantial cash-back awards for their involvement. With a few weeks left in the program, residents are able to receive up to ten percent cash-back incentives. This program, created and exclusively offered by Sullivan Solar Power, gives Santa Ana and North Tustin home and business owners the opportunity to save thousands of dollars on solar power systems. The cash-back incentive offered comes on top of the state rebate, federal tax credit, and monthly electric bill savings. 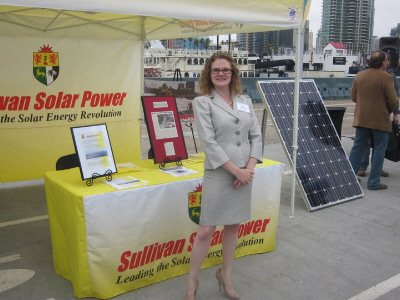 Sullivan Solar Power ran a similar incentive program in the city of Irvine last year. In the closing weeks of the Irvine program, more than 60% of the participants signed up to go solar. The Irvine Solar Program ended with 113,000 Watts of solar in the community, the largest collective deployment in the city’s history. Sullivan Solar Power is paying Irvine residents over $40,000 collectively for going solar as a result of this program’s success. To schedule a free site evaluation for your property, call 1-800-SULLIVAN. In order to be eligible to receive Santa Ana community incentives, participants must sign up by May 4. Additional information on the program can be found by visiting www.SantaAnaSolarProgram.org. Sullivan Solar Power is a turnkey solar system provider that delivers solar electric projects from concept to completion. The company has installed over 8,000,000 watts of solar power ranging from small-scale residential to large-scale commercial and municipal systems. Sullivan Solar Power is locally based out of Irvine, CA and owned and operated by Daniel Sullivan. The firm is San Diego’s number one local turnkey solar provider and services all of Southern California. Regardless of project size and scope, Sullivan is committed to delivering the best products and the most qualified professionals to its customers. Visit www.sullivansolarpower.com for more information.